Pulled pork does not have to be a chore to create and you certainly don’t need to run out and purchase it. You can create pulled in pork in the oven or a crockpot. Today we will concentrate on an oven pulled pork recipe. 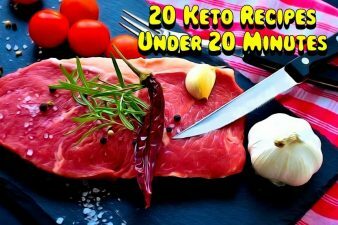 This can be used in Keto, Paleo, and Low-Carb Diets. 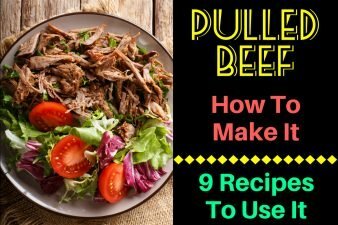 Included are 8 ways to use pulled pork. 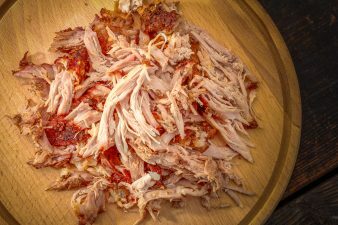 To properly cook and process the meat into the final pulled pork product you will need to do two things. The first is to completely sear the outside of the meat on the stovetop before putting it in the oven. This seals the meat allowing it to hold most of the juices. Get a large skillet and sear all sides until you have a nice crispy brown roast. One of the biggest mistakes we can make is putting a big slab of any meat in the oven without doing this first. The second and equally important step is for the meat to have time to absorb all the juices and flavors after you take it out of the oven. Allow it to sit in the pot, soaking up the juice and flavors until cool enough to pull the pork apart. Then put it in the fridge until the next day. I think of at least 1 or 2 new ways to use the meat every time I make a batch. There is virtually no end to different ways to use the products. I am giving you 8 of my favorites below, remember that for every option I am giving your below there are both standard, low carb and keto versions available. You will find many of them here on our website. Great on salads hot or cold. You can put on a simple green salad and use a little Apple Cider Vinegar and Oil or if you wish to try our Pulled Pork Slaw With Egg and Sauteed Onions recipe here on the website. You don’t have to be Canadian to love this. Make up a batch of fries (either in the oven or with a fryer) and top them with pulled pork and shredded mozzarella. Go over the works with some gravy. Oh, My Heavens it’s good. The perfect poor boy sandwich inside a baguette with cheese, lettuce, and tomato. You can also substitute coleslaw from the ‘Pulled Pork Slaw With Egg and Sauteed Onions’ recipe right out of the fridge. Choose any of your favorite enchilada recipes and substitute pulled pork instead of chicken. Kind of a really wet and cheesy Tamale. In a nonstick pan put in one tortilla and brown lightly on both sides. Spread on pulled pork and cover with cheese. Add any other vegetables you might like, I usually shred some onions (super thin) and cover with a second tortilla and press down until flat. Heat both sides until the cheese is melted and meat is warm. Mix 1 cup of pulled pork with onion, carrots, celery, garlic, and turmeric. Add salt and pepper to your taste and mash the ingredients together. Fill egg roll wraps and warm until the egg roll wraps are done in the oven or deep fry them till crispy brown. 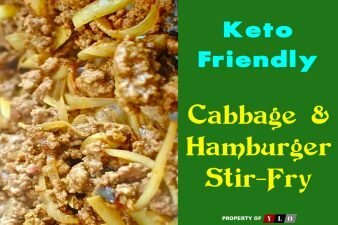 A keto version is to warm the mix in a skillet or pan until hot and create keto lettuce wraps. Serve with your favorite dip. Make some cornbread mix from scratch or use your favorite mix, we always liked the Pioneer brand but I am not sure if that is even available after being abroad for four years. Another variation is using a Tex Mex brand mix and adding corn and cheese to the center of the cornbread with the pork. Start with a layer of cornbread mix, load in the meat, cheese, and vegetables then cover that with the remainder of your mix. You can also make muffins the same way. Make a batch of pie dough or pastry dough. Mix in a large bowl, two cups of your pulled pork, favorite fresh vegetables, (you can use frozen or canned) with cheddar cheese and cream cheese, enough to fill your pies. Brush the top with butter and put into the oven until the dough is cooked and brown on top. 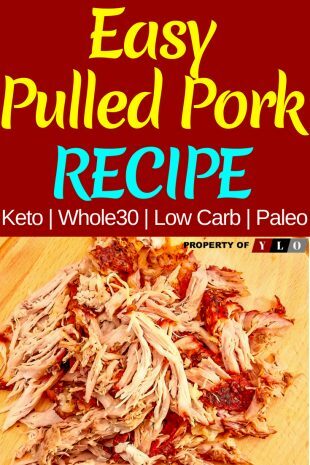 This is an easy way to make pulled pork which is a great base for many different recipes from salads to casserole meals your family will love. 1. Mix everything but the pork shoulder and the oil together in a large metal bowl. 2. Add in the pork shoulder and roll it in the seasoning well, packing on all the seasoning as best as you can. 3. Cover the bowl with saran wrap and refrigerate overnight (optional but very highly recommended). 4. Preheat the oven to 325 degrees. 5. Using a large dutch oven add the canola oil over medium-high heat. 6. Brown the pork on all sides then turn off the stovetop. 8. Place the pork on top then cover. 9. Cook for 3 – 3 1/2 hours. 10. Shred and refrigerate overnight before serving. Be sure and watch the video below for a simple tip on how to pull the pork the quick and easy way. Once again please comment if you try our recipe and tell us how you like it.